This is a short fun reblog from SocioPolitical Dysfunction a political site. However side stepping the politics and the humour of the post – it does raise a question pertinent to education? What’s better putting the kids in front of a computer screen or giving the kids real and tangible toys to play with? Virtual Worlds in the Classroom: How much gaming does your classroom have? The problem teachers face is in finding ways to come up with a balanced blend? What I am doing in the new book about to be launched on Teachers Pay Teachers called Traditional and Virtual Puzzle Worlds is modell a proactive answer to this dichotomy. Sometime today my first book Global Citizens Creative Arts Text. Insights and Activities will be set to $0 for two days so that people can download a copy. I am after feedback about the strategies and insights. 5. $20 buys the whole world of Minecraft not just one Lego vehicle. 4. Stepping on a Lego is hurts. 3. A couple MB save files takes up a lot less space than a Lego castle. 2. 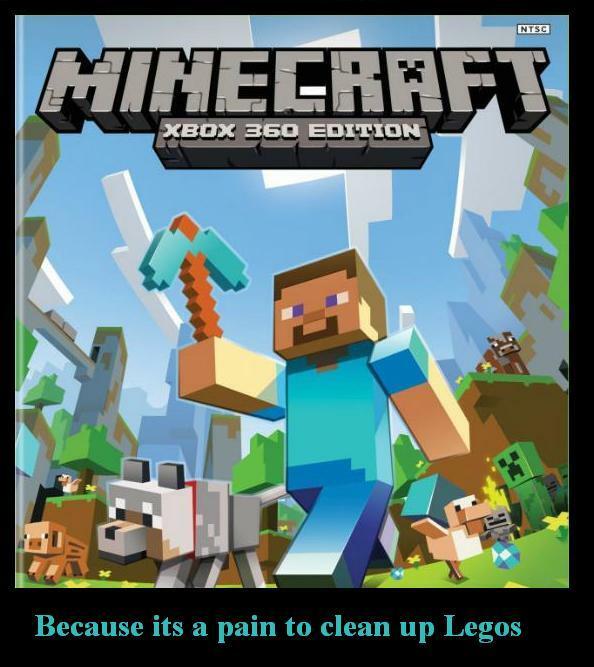 Saving a Minecraft game is easier than picking up Legos. 1. I’m not allowed to blow up my Legos with TNT. This entry was posted in creative arts leadership, LEGO as ART and tagged balance, book give away, educational value, entertainment, lego as art, minecraft as art, real world, thinking skills, toys, virtual on 11/06/2013 by Jo Murphy. As an adult fan of Lego I can tell you that having object in your hand is much better learning. Lego mechanical systems have lots of ‘play’ and you can build bigger than they will support.. (think of a plastic chain snapping apart under stress) and this teaches more about mechanical design than any computer would do. Look at the Great Ball Contraption to see what I mean. It’s something you won’t get as a child if you’re staring at a screen. You’re going to want to hear the sound on this one. Each module is built by different person. They all cooperate to make the biggest machine they can make. None of it is professionally done. This is something that children can do. It does teach mechanical understanding, design, engineering… and it’s completely accessible to children.